The Tarot deck is a deck of playing cards that are used to divine the future and map a person’s fate and personality. Divination is the supernatural sense of the unknowable. Usually, diviners use their skills to learn about future events, but it can also be used to delve into the various aspects that make up someone’s personality. Divination has been in use since before recorded history. It was used to predict weather, determine the best time to wage war, and more. Divination is a practice found in nearly all cultures. In the 1500’s, the Tarot deck was developed in Europe. This deck was originally used for card games, but it was later adapted as a divination tool. The transformation from playing cards into divining cards happened in around the 18th century. There are many varieties of Tarot decks. The most common variety in English speaking countries is the Rider-Waite Tarot deck. In Latin countries, the most popular deck is the Tarot de Marseille. This deck was published by the Rider company, and the illustrations were imagined by the mystic Arthur Edward Waite. Waite described his visions to the artist Pamela Colman Smith, who did the actual illustration in the Rider-Waite Tarot deck. The Rider-Waite Tarot deck differs from earlier decks in a few notable ways. One of the most obvious changes made by Arthur Edward Waite was that the Christian imagery was removed, or at the very least seriously toned down. For example, in earlier decks, one card was called “The Pope.” Waite changed this to “The Hierophant,” and represented a pagan spiritual leader rather than a Christian one. 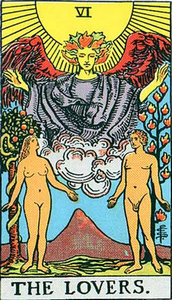 The Tarot deck is divided into two Arcana: The Minor Arcana and the Major Arcana. The Major Arcana represent a set of twenty two different cards. The Minor Arcana represent a set of fifty six different cards. Together, they make a complete set of seventy eight Tarot cards. In the Rider-Waite Tarot deck, the Minor Arcana receive as much detail in illustration as the Major Arcana. This is quite a departure from earlier decks, which reserved most of the detail for the Major Arcana. This made the entire deck a visual feast for the eyes, since every single card had intricate illustrations. Waite’s second book featured black and white plates of all seventy eight Tarot cards. This book went into greater depth regarding the divinatory aspects of the Tarot deck. This book popularized a method of divination called the “Celtic Cross Tarot” layout. This method remains one of the most popular methods of conducting a Tarot reading today. It involves arranging the cards from the deck in a cross, where each card and its position are equally important in determining the meaning of a Tarot reading. Other forms of divination tools exist. For example, the diviner’s rod, or dowsing rod, is a rod that can be used to discover precious resources buried deep underground. A diviner places the rod (or rods) in their hands, and surveys a site. As the diviner walks, the rods may move on their own accord. A large movement of the rod indicates the presence of some valuable resource. Diviner’s rods are used to find deposits of gold, sources of drinking water, and other precious resources. The Tarot deck is a very popular set of cards that have been in use for centuries. Originally meant for card games, the deck later went on to become a popular divination tool. The divinatory aspect of the Tarot deck is a major component of popular culture today, and the deck is featured in many movies and television shows. Most decks used in such films are the Rider-Waite deck, making it the modern face of Tarot. If you happen to be interested in a professional tarot reading, I’d recommend visting 1800 tarot. One of my personal favorite tarot readers is Psychic Stella, who is also a talented clairvoyant.